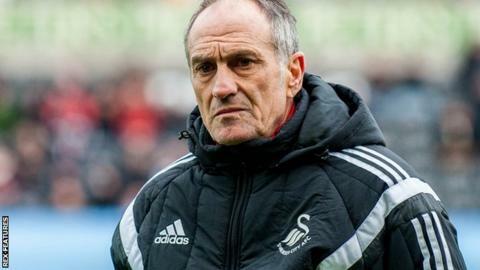 Swansea boss Francesco Guidolin will miss Saturday's Premier League visit of Norwich as he remains in hospital to recover from a chest infection. The Italian, 60, missed Wednesday's victory over Arsenal, hours after he was first admitted in London. He saw a respiratory specialist after failing to fully respond to treatment. "He remains in a comfortable position and is making good progress but doctors have advised he misses this game to continue his recovery," Swansea said. "He is expected to remain in hospital over the weekend before his release. "Everyone at Swansea City continue to wish him a speedy recovery. "Alan Curtis will continue to carry out his duties for the fixture against the Canaries." Swans coach Curtis took charge of the side at Emirates Stadium and said the win will have lifted Guidolin's spirits. After Saturday's game against relegation rivals Norwich, the Swans travel to Bournemouth on 12 March and then bottom club Aston Villa visit the Liberty Stadium on 19 March. Wednesday's victory moved Swansea six points above the relegation zone in 16th place.